I was especially thrilled with the win because the baked oatmeal is truly a favorite recipe with family and friends and one that has spurred many seasonal variations. I couldn’t even wager a guess as to how many times I have baked this recipe! Throughout the contest, however, I noticed that several of the other recipes looked rather intriguing. One particular dessert by Recipe for Fitness particularly caught my eye. I even shared it on my Fountain Avenue Kitchen Facebook page. Last night, I had family coming for dinner and it occurred to me that this would be a fun dessert to try. What’s more, I had all the ingredients on hand and it would meet the needs of a gluten free eater in the group. I love that this recipe is really clean eating–especially impressive in the dessert category. With the exception of the chocolate chips–I actually used chunks–there are no processed ingredients and the peanut butter packs a terrific protein punch. While I did adapt the recipe in several ways (click here for original recipe), I did not change it in a way that would fundamentally alter the taste or texture. While there were several good-natured jokes about eating one of my “competitor’s” recipes, the feedback from every single person around the dining room table was positive. Even my 21-month-old niece gobbled her piece and proclaimed that she would like to take some home with her. 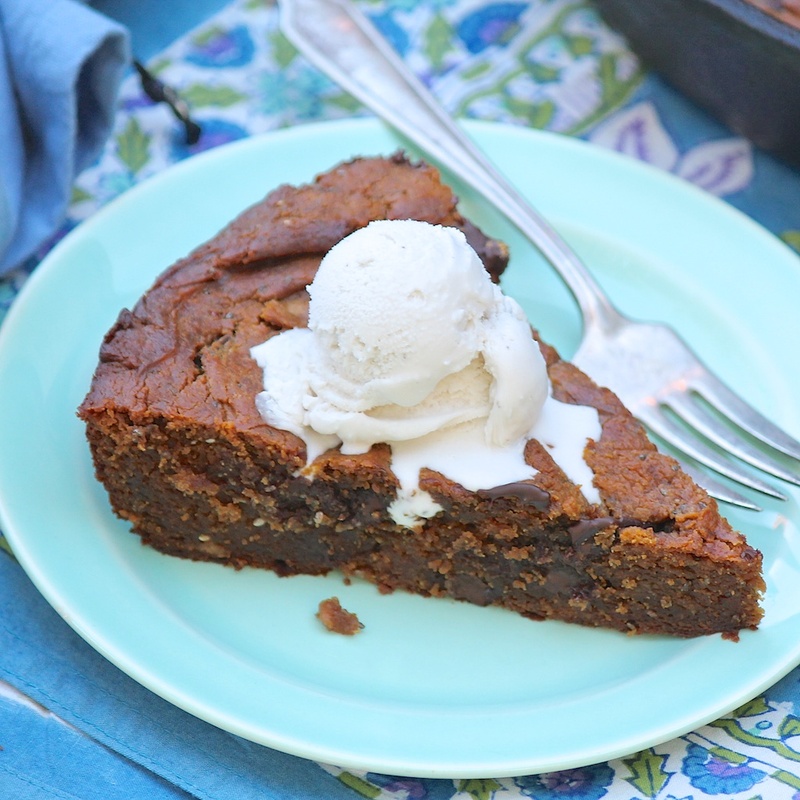 My hat goes off to Recipe for Fitness for this creative, wholesome dessert…it truly got my vote! UPDATE #1: While this recipe was delicious freshly cooked with a scoop of ice cream, I thought it tasted even better with time. I stored the last few pieces in the refrigerator (seemingly out of sight from anyone else! ), and two and three days later, this dessert was as rich and satisfying to me as my favorite brownie–truly incredible yet packed with protein and a fair share of nutrients. I loved the bit of crunch provided by the chocolate chunks, too. This recipe is a “make again” recipe, for sure! UPDATE #2: I recently made a modified version of this recipe which has been quite popular with my newspaper readers. See the photo and link to the adapted recipe, below. This recipe is rich and smooth--almost like a gooey brownie. If you like a little crunch, you could try using a crunchy peanut butter. Add baking soda, cinnamon, and salt. Stir until all ingredients are thoroughly combined. Add honey and mix until fully incorporated. Stir chocolate chunks into the batter. Spread batter into a lightly greased, 10-inch cast iron skillet. Remove from oven and allow to cool for about 5-10 minutes. 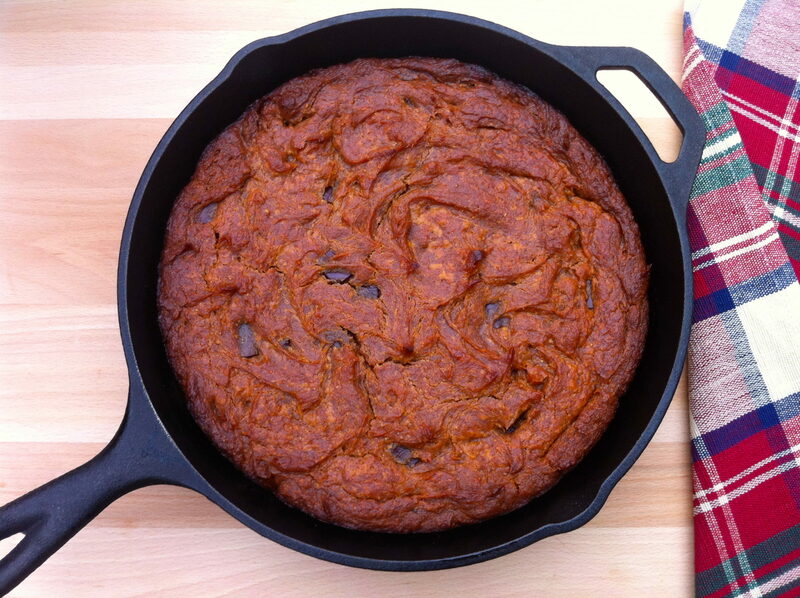 If you don’t have a cast iron skillet, a 9×9 square baking dish would be a good substitute. This recipe may be prepared entirely gluten free and/or dairy free by purchasing gluten free and/or dairy free chocolate chips. Also, Smart Balance has a 16-ounce container of peanut butter that is perfect for this recipe if you wish to try their product. Another great recipe! I do believe I will be making this very soon. You are welcome! It was fun to try one of the other contest recipes and this did not disappoint! Thank you so much, Ann! 😀 And likewise, I can’t wait to try out your recipe! Thank you for making a recipe that tastes as good as it looks, Chelle! What’s more, it’s the perfect option when a gluten-free dessert is needed! I think this one is right up your alley, Amee! Hope you like! This sounds divine to someone who has recently had to go grain-free and dairy-free…me (and my mother). Just wondering if it could also be made using almond butter instead of the peanut butter without compromising the recipe? Sometimes almond butter seems a little “juicier” than peanut butter. Also, there is a brand of chocolate chips that are free of all the common allergens (including dairy and soy, which is hard to find). The brand is ENJOY LIFE and I think they taste just as good as any other chocolate chips I’ve ever had– they also make chocolate chunks! Though I have thought of making this recipe with almond butter, I have not yet. My plan is to try it first with half peanut and half almond butter. I am optimistic it would work but like the idea of transitioning slowly! Thank you for mentioning the dairy and soy-free chocolate chips. Would you believe I just bought a bag of the Enjoy Life chunks but have yet to try them? Now I am extra excited to use them!